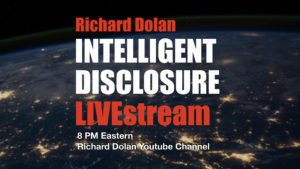 Join Richard as he discusses everything related to UFOs, global politics, weird science, future tech, and personal philosophy. New shows are posted on YouTube and this site (links below) Monday nights 8pm EST, occasional weeks off. PLEASE NOTE: KGRA broadcasts of Richard’s shows are now done at least one week AFTER the original Youtube broadcasts. They are not synchronized with the Youtube broadcasts. 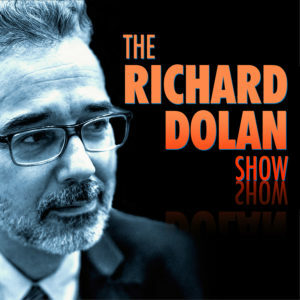 You can still listen to the Richard Dolan Show every Monday night from 8 p.m. to 10 p.m.EST, on KGRAradio.com. I like what Steve Basset has to say but I just don’t buy that Hillary would have disclosed. The reason being they , her team was not prepared for what would have happened afterwards. In a similar vein, this is why the To the Stars Academy is proceeding so cautiously. Initially they implied that many facts would be revealed. They have revealed only a little. Perhaps there are deep factions within the intelligence and military that are still in control who don’t want this to happen. Your thoughts please. Self corrections. Autoscript changed my words: The reason being, her team . . .
Military and Intelligence communities . . . Sorry I must doing something wrong I’ll I get is a repeat broad cast with Richard M. Dolan – The Peter Levenda Inteview can’t get the current live show? Hi Ed, this is Richard. Sorry for the confusion. I am not doing a new live show tonight. In the midst of a bit of retooling but all is well. I will be interviewing Frank Feschino this week for the next RDS, and in fact I suspect that will generate multiple parts. We shall see. For tonight, it’s a repeat on KGRA. You can go to my Youtube Channel to see all the old ones, and indeed they are also here on this website as well. Thanks look forward to the interview.